Recognising future trends Warton is also working on UCAS and UAS types and from 2012 has been more open about them. These aircraft are a variety of sizes from very small to medium sized and as yet are an immature technology. It has been said for many years that the aircrew are a limiting factor to aircraft manoeuverability and the roles that aircraft are used in. The timeframe for unmanned aircraft with serious capability has repeatedly gone back although now inroads are being made particularly in high risk and long duration roles. In 2016 we read about US drone attacks piloted from bases in the US and firing missiles to take out targets that have been trailed for days. Very small drones are in the news and becoming a public 'toy' providing interestng photographic opportunities, possibly a menace. There is a UK/French UCAS project to be developed from the Taranis. At this time there is no known issued military requirement likely to result in an order providing the industrial significance of say a Typhoon. Instead of the recognised major players, this field has scope for an innovator although transforming that into a serious candidate might be another matter. Several companies are vying for the best ideas by producing demonstrators and obtaining low quantity orders. It will be interesting to see where the future of military aircraft development and manufacture goes after Typhoon and Lightning II. Not to forget the impact on other high technology capabilities in the UK like engines and avionics. November 2014 UK signs an agreement with France on Future Combat Air System which is being kept separate from Taranis development. The FCAS is to result in a design by end of 2016. This is expected to lead to the manufacture of a prototype. In July 2016 Flight magazine reported further studies will be funded and result in a technical review around 2020 with a demonstrator flight around 2025. On 11th May 2016 the Royal Aeronautical Society held a lecture on Flight Testing the Taranis. Guest speakers were from BAE Systems: Paddy Bourne - Chief Engineer UCAS, Jon Wiggall - Flight Test Taranis, Neil Dawson - Chief Test Pilot Taranis. The report in Flight Magazine seemed a bit secretive referring to the 'manufacturers' and stating there was no clearance to say what comes next. Flight Testing in 2013 and 2014 was done in an empty area around Woomera in Australia with the aircraft in automatic mode where it can self pilot and search by itself. Low Observability was said to be a challenge. On 9th July 2012 BAE SYSTEMS announced: Taranis, the UK's unmanned combat air system technology demonstrator, has successfully completed a series of key tests on the way to commencing flight trials in 2013.The low observable (LO) platform recently completed radar cross section tests at BAE Systems Warton site and the initial analysis has indicated that the programme has met and potentially exceeded the extremely challenging targets jointly aspired to by the UK's Ministry of Defence (MOD) and Industry. In addition, the testing of the propulsion system has been completed. Undertaken at Rolls-Royce, the testing included measurement of Taranis's infra-red signature and the results have demonstrated BAE Systems and Rolls-Royce's credentials in designing and manufacturing an LO propulsion system. As a result of these positive initial test results, the MOD requested an extension to the testing. The output of these additional tests is currently being analysed and due to this extension, the flight trials are planned to take place in 2013. Tom Fillingham, Future Combat Air Systems Director said: 'When considered together, the results of these two key test programmes demonstrate the UK's ability to design low observable solutions for our future unmanned combat systems. On 12th July 2010 BAE SYSTEMS at Warton unveiled the prototype unmanned combat concept demonstrator aircraft, the Taranis. The event was attended by the Minister for International Security Strategy Gerald Howarth. The aircraft has been produced via an informal partnership of the UK MoD and industry including BAE Systems, Rolls Royce, QinetiQ and GE Aviation. Nigel Whitehead, Group Managing Director of BAE SYSTEMS Programmes & Support business, said: "Taranis has been three and a half years in the making and is the product of more than a million man-hours. It represents a significant step forward in this country's fast-jet capability. This technology is key to sustaining a strong industrial base and to maintain the UK's leading position as a centre for engineering excellence and innovation." Link to BAE SYSTEMS press release. Previously it was known that the Taranis is a UAV Technology Demonstrator that will lead to an Unmanned Combat Air Vehicle (UCAV). Over ?100m has been allocated UK Government's Strategic Unmanned Air Vehicle Experiment (SUAVE). The project is being led from Warton by the Autonomous Systems and Future Capability team. There is support from other BAE Systems teams in the UK and in Australia. Industry partners on this MoD led project include Rolls-Royce; QinetiQ and Smiths Aerospace. The aircraft has a stealth appearance of an F117. The Mantis tactical UAS demonstrator was built at Warton and is due to fly in Australia in 2009. It was shown at Farnborough last year and has a more conventional appearance with twin prop engined mounted on the fuselage. On 12th July 2012 BAE Systems announced. 'Flying Mantis will enable the Company to continue to mature a number of UAS capabilities and technologies, underpinning BAE Systems? strategy to become a world-class provider of unmanned air systems. The flight activity will support the development of future MALE (Medium Altitude Long Endurance) and UCAS (Unmanned Combat Air Systems) operational capabilities, including the programmes announced at the Anglo-French Summit in February this year. By looking to fly Mantis in the UK, BAE Systems is directly aiming to address the associated challenges of airspace integration and safe operation of an airborne system in accordance with UK rules and regulations. Over the coming months the Company will be working with the appropriate regulators to fully understand the safety, airworthiness and regulatory frameworks which will enable such a flight to take place in 2013. The Company is currently looking at a number of potential locations in the UK which meet the trials objectives and will work with a number of agencies on the feasibility, timing and location of the flights.? These locations will be selected in full consultation with the relevant authorities.? Such systems can operate completely remotely without ground control and could be very small, 20kg, for use as police search or coastguard. At present the electronics are being tested in a Jetstream flying test bed over the Irish Sea. In April 2013 a flight from Warton to Inverness, 500 miles, was performed under control of ground based crew. The Project Director, Lambert Dopping-Hepenstal, states on the ASTRAEA website, '....the first adopters will be the police and the coast guards because they can be licensed nationally and have extensive manned operational experience in the areas (search, surveillance, etc.) where they could benefit from operating unmanned vehicles......... But public perception is a real hurdle for UAS,He said, especially in the UK. We hear mostly about killer drones and spies in the sky and it will take time for people to understand the benefits UAS will provide. ASTRAEA (Autonomous Systems Technology Related Airborne Evaluation & Assessment) is a UK industry-led consortium focusing on the technologies, systems, facilities, procedures and regulations that will allow autonomous vehicles to operate safely and routinely in civil airspace over the United Kingdom. This ground-breaking, ?62 million effort is led by an impressive consortium of seven companies: AOS, BAE Systems, Cassidian, Cobham, QinetiQ, Rolls-Royce and Thales. 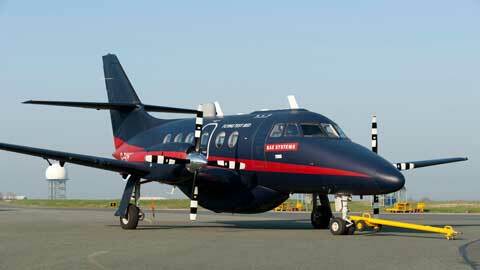 The BAE Systems Jetstream, known as 'The Flying Testbed', is an aerial laboratory. It's a unique aircraft which has been developed to be flown by pilots or as an Uninhabited Air Vehicle (UAV). Racks of computers and control systems in the rear of the aircraft, together with satellite communications, mean it can fly as if it were a UAV without any input from the pilots. It will trial a range of new technologies to be developed under the ASTRAEA programme, including what is believed to be the world's first autonomous weather avoidance system, in addition to 'sense and avoid' technologies and an autonomous emergency landing system. HERTI's first flight was in December 2004. It builds on the Kestrel, Raven and Corax programmes which had also flown. It is a low cost, long endurance vehicle suited to reconnaissance and surveillance in both the military and civil sectors. Although centred at Warton the aircraft is built at Slingsby Aviation.